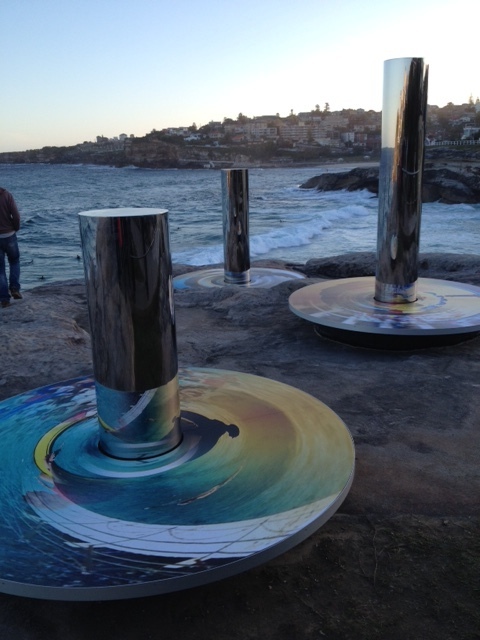 A little off topic, but I wondered into the world of art, and more specifically sculptures last night when I attended the preview of the Sculptue by the Sea exhibition in Bondi. We were blessed with a beautiful evening and the company of some incredibly talented sculptors. Stephen King, winner of last years Sculpture Prize talked us through his exhibit for this year. A sculpture called ‘the folly’. He was delightful and very humble. 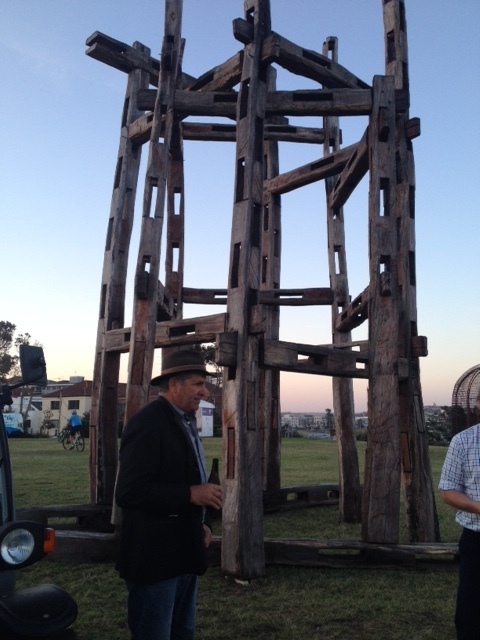 The sculpture is made from stringy bark that has fallen on his own farm in country NSW. Here he with ‘the folly’. I loved the ‘Coast Totem’ by Linda Matthews in collaboration with Carterwilliamson. It would look different again in bright sunlight, but looked just spectacular with the waves crashing behind it. and my favourite piece from the Sculpture Inside Gallery was Braddon Snape’s sculpture above. It was so full of wonder. What was fascinating for me was how similar sculpture is to writing in its subjectivity. Just listening to the reactions of others in our group as they ooh’d and ahh’d, whilst I scratched my head, or as they walked straight passed a piece that I could have stood and looked at for hours. We were lucky enough to have Dr Michael Hill, Head of Art History & Theory, National Art School to talk us through many of the pieces. His love for sculpture was infectious. He was also able to give us a brief glimpse at the complexity and craft behind what can sometimes appear to be a fairly basic structure. I would certainly recommend a visit to this years exhibition, some of the exhibits are truly interactive, making it great fun for all the family. But word is, don’t leave it until the last weekend, it is too packet to even get close to the sculptures. It runs from 23rd Oct to 9th Nov. Enjoy!